And on the final day of Ms NAIDOC, I'd like to share this profile of Andrea James as received from her long-time friend Brhaspati. It's really great to feature Andrea on the final day because Andrea was someone who blazed a couple of trails that I ended up following! We are both La Trobe Uni graduates who majored in theatre and drama, and she worked at the Vic College of the Arts a few years before I did. It seems a completely appropriate way to finish up Ms NAIDOC for this year, and I'd just like to say thank you to all those who submitted stuff, who had their profiles up, and who read and shared these. You are truly wonderful and it has been great to carve out some space and celebrate some amazing black women. Without further ado, here's Andrea as told by Brhaspati! The pic was taken in 2002 in Deoghar. Andrea is on the left, Brhaspati is on the right and in the middle is Arjit. When I first suggested that I wanted to profile her for Ms NAIDOC 2014, Andrea James laughed bashfully, downplaying her achievements and talking up the artists and elders with whom she works. This is entirely in keeping with the Andrea I have known for 12 years – a warm, generous and self-effacing woman of Yorta Yorta, Kurnai and Polish descent who is characteristically modest about the international impact of her creative work. 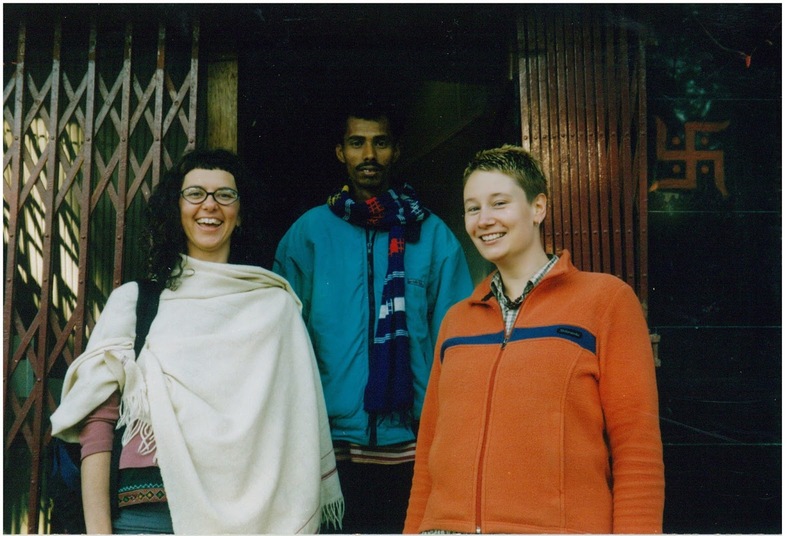 Andrea & I first crossed paths in North India, on a month-long pilgrimage to the ashrams of the Satyananda Yoga lineage in Uttaranchal, Jharkhand and Bihar. We bonded over shared rooms, chai stalls, pre-dawn asana on the rooftop to the call of the mosque’s muezzin and wanderings along the banks of the Ganga. During one of these strolls, Andrea mentioned, in passing, that she was using her time in India to work on a play she was writing. It was not until I attended the premiere season of Yanagai! Yanagai! at the Malthouse Theatre in Melbourne in 2003 that I realised the significance of what she referred to as her ‘little play’. Yanagai! Yanagai! tells the story of her mob’s ongoing connection to their freshwater country along the Murray River in north eastern Victoria. This is an important story to tell, given the context of the Yorta Yorta people’s Native Title bid being thwarted on the basis that colonial dispossession, genocide and assimilation via Cumeraganga Mission had supposedly severed their link to their culture and language. The play toured internationally, being performed in New York and Glasgow, translated into Italian and published by Currency Press. In her role at Blacktown Arts Centre, Andrea programmed The Native Institute + Sites of Experimentation exhibition in 2013, commissioning contemporary Aboriginal artists to reveal the history of the Blacktown Native Institute from an Aboriginal perspective through site-specific installations and visual art works. Andrea collaborated with Giordano Nanni and Ilbijerri Theatre to stage Coranderrk: We will show the country at La Mama Theatre in Melbourne (2011), the Sydney Opera House (2012) and the Belvoir Street Theatre (2013-14). Coranderrk brings to the stage the voices of Aboriginal people residing at Coranderrk Aboriginal Station near Healesville, Victoria who submitted evidence to an 1881 Parliamentary Hearing. When Andrea spoke of popping down to Melbourne to do some more writing with Giordano, she neglected to mention that this was for a weighty AIATSIS publication they launched in 2013. Her most recent curatorial work, Hereby Make Protest at Carriageworks, tells the story of the Aborigines Progressive Association and the Australian Aboriginal Progress Association, who decreed 26th January 1938, the 150th anniversary of British colonisation of their land, a Day of Mourning. Weaving historical documentation with commissioned works by contemporary Aboriginal artists, the exhibition highlights Aboriginal resistance in the face of systemic racism. Andrea consistently takes a self-effacing yet fiercely compassionate approach to bringing Aboriginal lived experiences to life via the stage, and, more recently through exhibitions. As a playwright, director, actor, and now curator, she combines historical documents and contemporary art forms to engage, educate and challenge her audiences and achieve justice for Aboriginal and Torres Strait Islander peoples. I am proud to call this deadly woman my friend.